“We parade three times a day, at six o’clock in the morning, at ten and four. The men are drilled from one to two hours each time. Guard is mounted at 11 o’clock, and in addition to the regular sentries the town is patrolled during the night. One party goes east, the other west of the guard room, which is the new market building near the Wilson House. There is also a gun boat which cruises up and down the river, so that you see the Fenians can hardly take us unawares. The men are all cheerful and contented. As there are only six companies in town they are pretty well accommodated, in fact much better than their brethren in arms at Prescott, some of whom are quartered in an old brewery with one blanket apiece to sleep on. Though many have left home at great personal loss they all seem willing to remain away so long as it may be necessary for the defence of their country. “The Fenians, warned by their defeat at Fort Erie and the chase of the Royal Guides at Pigeon Hill in Missiquoi County, have quieted down and apparently given up the idea of taking Canada at present. The Canadian Government, having a due regard to economy and considering the immediate danger past, have ordered home a portion of the Volunteer force who have been on duty on the frontier for the past fortnight. On Saturday evening last, Lieut. Colonel Crawford, who was in command of the force stationed at Brockville, received an order to relieve from further service the Almonte and Carleton Place companies which formed a portion of the Battalion under his command. Arrangements were made with the B. & O. R.R. to have a special train in readiness on Sunday afternoon at 2 o’clock to convey them to their homes. The Battalion mustered in the Court House Square and, having wheeled into line, formed fours and marched to the station. The Almonte and Carleton Place men having got on board, the train moved off amid the cheers of the Brockville and Perth companies which were drawn up in line on the platform. The run was made to Carleton Place in a little over two hours, and in a few minutes the brave fellows were surrounded by their friends. It is a matter of congratulation that they were not required to place themselves in immediate danger, as also that they did not require the services of the young ladies who kindly volunteered to do service if necessary. Another four years of danger lay ahead. The second overt challenge came when forces under the Fenian Brotherhood president and military firebrand, John O”Neill, rallied again in 1870 by grace of insufficient United States government restraint, to attack the new Dominion of Canada, and Canadian militia units were placed on duty at points of possible invasion on our Quebec and Ontario international borders. 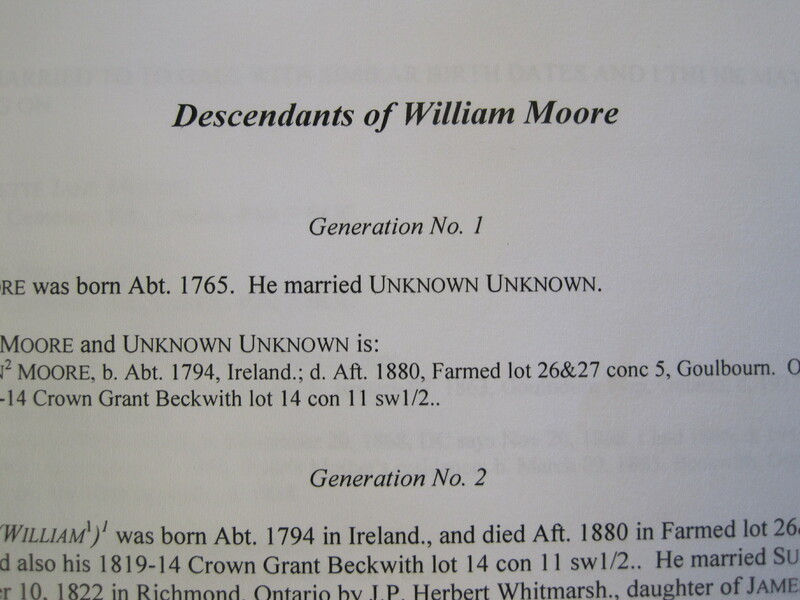 Researchers take note – Frances Moore has delivered her Moore Family History to the library! It’s been seven years in the making. Thank you so much Frances! This is a welcome addition to our family history section in the Local History Room, where it is available for all to view. I would like to take this opportunity to ask other people in our community who may have completed family histories, to think about donating a copy to the library. We often have people drop by or email us with questions about local families, and would love to be able to answer their questions. A. Houston – Arthur Norman Houston, WW 1. R. E. McEachen – Rebecca Ellen McEachen, WW 1. 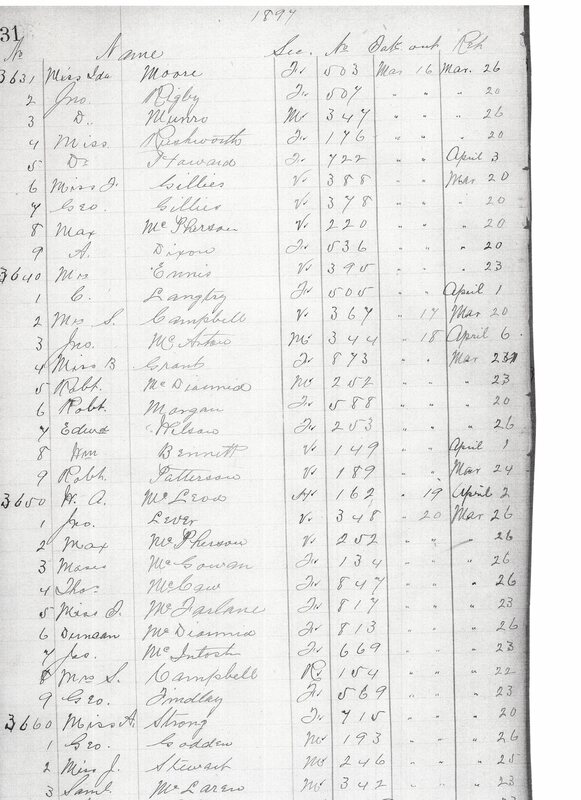 The company’s roll books list the men of the Carleton Place Rifle Company on active service at Brockville in 1866. Service medals were worn long afterwards by many Fenian Raid veterans of this district, and their ultimate obituary notices recalled their response at this early time of homeland danger and attack. There were fifty-seven of all ranks on the June active service roll of the Carleton Place Rifle company, including Captain James Poole, Lieutenant John Brown, Ensign Josiah Jones Bell, four sergeants, six corporals and a youthful bugler. Since many descendants of this ‘noble fifty’, as they were termed on occasion in later years, now live in the Carleton Place area and other parts of Eastern Ontario, their names will be recalled here, with their occupations and approximate ages where these now have been found. Lieutenant Bell left Carleton Place to serve in Manitoba as an officer of the First Ontario Battalion of Rifles shortly before Fenian raiders assembled again in arms on the Quebec and Ontario border. William Morphy (1833-1873), sergeant, a son of local pioneer settlers William Morphy and Sarah Willis, had been treasurer of Beckwith township, including Carleton Place, and was a business real estate owner. His stone residence, which he named Spring Side Hall, remains on Lake Avenue at Campbell Street. Sergeant William H. Moore, then 39, ran a Carleton Place shoemaking business. Sergeant Daniel McArthur, clerk, age 27, was a relative of Archibald McArthur, merchant and first owner of the town’s textile mill operated for over fifty years by the Bates & Innes firm. Sergeant William Neelin (1828-1900), shoemaker, whose wife was pioneer John Morphy’s daughter Barbara, became a general merchant and real estate dealer. 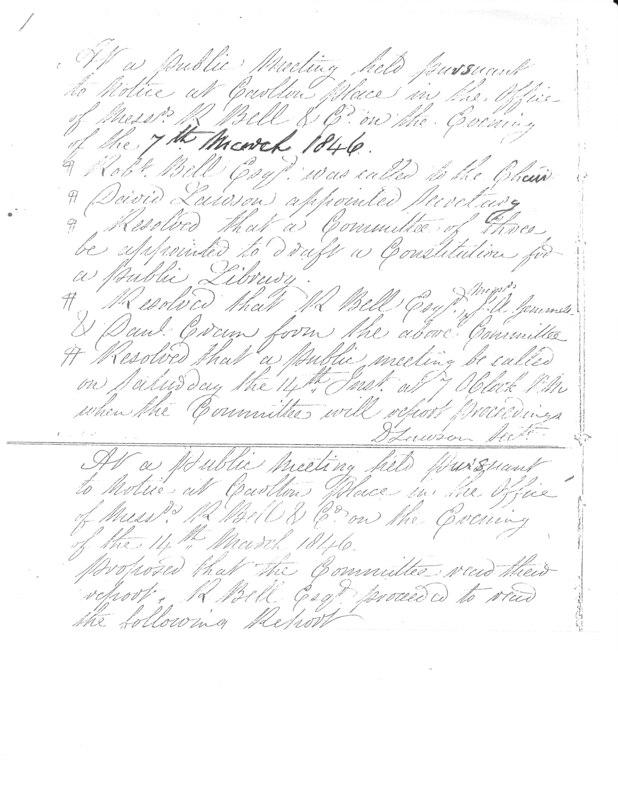 The six corporals of the Carleton Place company serving during the 1866 raids included Robert Metcalf, age 32, a well known local hotel proprietor, and David McPherson and David McNab. Corporal John M. Sinclair (1842-1926), then a medical student, born in Beckwith at Scotch Corners, was a doctor in Carleton Place for over thirty years. Corporal James Kilpatrick, age 31, was a cooper, and Corporal William Patterson (1840-1908), was then a furniture maker and dealer and later also an undertaker, founder of the town’s present firm of that name. The company’s fifteen year old buglar, Robert William Bell (1851-1923), a grandson of the Rev. William Bell of Perth, was the younger son of Robert Bell, the long-prominent Carleton Place figure in business and public affairs who was then the Inspector of Canal Revenues of the Canadian government. Robert junior graduated as a medical doctor at McGill University in 1873 and practiced at Peterborough, where he was Lieut. Colonel of the 57th Battalion of militia. His later professional career was in the administration of Ontario mental hospitals. It was due to his aid, and to the sustained public honouring of these volunteers, that particulars of Carleton Place militia company roll books of Fenian Raid service were published in 1898 by Carleton Place Herald editor William H. Allen. Its veterans of this area were parading then in Dominion Day celebrations. There were forty-three privates in the ranks of the Carleton Place Rifle Company in its June, 1866, service on the St. Lawrence River front. They included Maurice Burke (1839-1911), a cooper; Andrew Coleman, age 33, shoemaker; and James D. Coleman, 22, who already had been a soldier in the Union Army in the United States Civil War. James Doherty Coleman, (1844-1919), of the Gillies lumber company at Carleton Place and Braeside and later a Manitoba senior employee of the Canadian Pacific Railway Company, was the father of a family including C.P.R. president D. C. Coleman (1879-1956), E. H. Coleman, Canadian government deputy minister and ambassador; George T. Coleman, former Carleton Place mayor and senior railway official, and Mrs. A. R. Garson of Carleton Place. And then private William Cram, age 22, was a son of Duncan, Beckwith farmer. William Dack was later a Carleton Place merchant. John Doherty (1840-1891), son of William of Glen Isle, became a Beckwith farmer and operated a marble cutting and stone quarrying business. William (‘Big Bill’) Duff, then age 25, ran his retail dairy and his lakeshore farm, which once included Lake Park, until his death in 1914. William Enright, A. Adams, Peter Ferguson, Robert Fleming and Archibald Hamilton also were in the 1866 ranks. William P. Gray, 26, was a painter, and John Henry (1838-1892), a Ramsay farmer near Carleton Place. Ephriam Kilpatrick, age 18, was a cooper, as was Francis Lavallee. Jacob Leslie (1835-1909), serving at age 31, was a furniture maker and undertaker. His Carleton Place business was continued by his son George, who in turn was succeeded until 1951 by W. H. Matthews, a former mayor. James Moore, 25, was a shoemaker and Archibald McCallum, 21, a sawmill worker, as was also Lachlan McCallum (1834-1915), who long was the captain of the big sawmill steamboat “The Enterprise.” James McFadden, age 30, was a shoemaker; Drummond McNeely, 27, a carpenter; Nathaniel McNeely, 38, a blacksmith; and George McPherson, 26, a butcher and later a hotel-keeper. Private James Moffatt, Absolem McCaffery, William McEwen, Alex. Romey, William Rorrison, Donald Stewart (‘Donald the Piper”), James Storie and David Williams were others of the Carleton Place ranks of ’66. Private William Pattie, carpenter, building contractor and second mayor of Carleton Place, was then age 23; and William Rattray (1845-1894), Beckwith 11th Line farmer, was 21. John Sumner, 17, was a son of John Sumner, merchant, who had been lieutenant colonel of the 3rd Carleton Battalion of the sedentary militia. Patrick Tucker, 30, was long a Carleton Place shoemaker; and John Wilson, 19, was a son of Dr. William Wilson. The Willis families were represented by four sons in the 1866 Fenian Raid defence service of the Carleton Place Rifle Company. The youngest, Catin Willis, age 17, was a son of Catin Willis (1795-1869), pioneer Ramsay farmer near Carleton Place. Richard Willis, 25, George E. Willis, 22, and James Willis, 21, were born on the farm of their father George Willis (1820-1892) at the west end of Lake Avenue. George E. Willis, who lived until 1940 and the age of 96, was for some years a Carleton Place photographer. Photographs made by him remain in many old family albums of this area. (His son Stephen founded the Willis Business College in Ottawa.) Richard, who was drowned in 1893 while duck hunting in the lower Mississippi Lake, was the father of the veteran Mississippi rivermen Henry and George Willis. 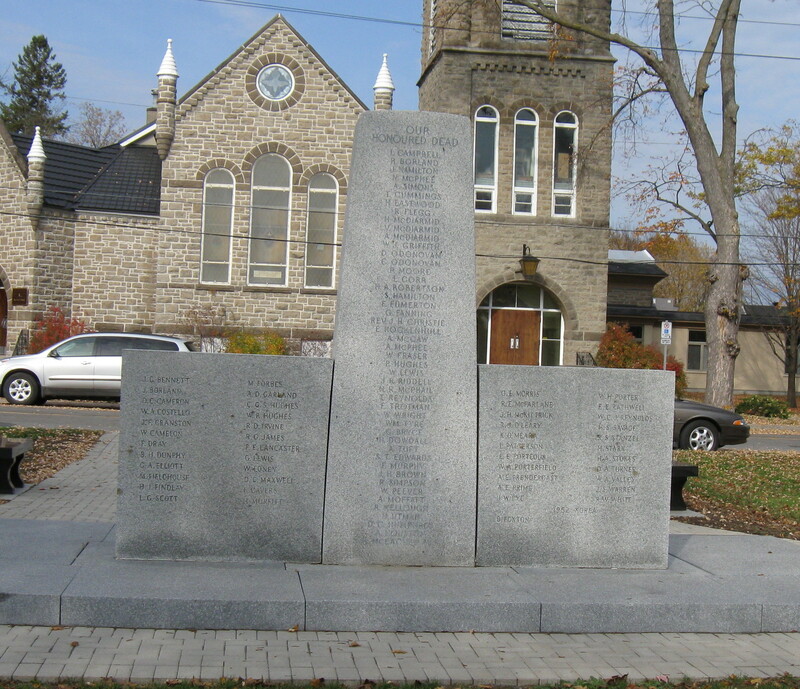 John Cavers, William Beck and William Cram, all of the Carleton Place area, returned from the United States in 1866 with Chicago’s No.1Company of Volunteers for Canada to serve in their country’s defence. “At a public meeting held pursuant to notice at Carlton* Place in the office of Messrs. R. Bell & Co. on the evening of the 7th March, 1846. Robt. Bell Esq. was called to the chair. David Lawson appointed secretary. Resolved that a Committee of three be appointed to draft a constitution for a public library. Resolved that R. Bell Esq. & Messrs. J. A. Gemmel & David Cram form the above Committee. Resolved that a public meeting be called on Saturday the 14th Inst. At 7 o’clock p.m. when the Committee will report proceedings. At a public meeting held pursuant to notice at Carlton Place in office of Messrs. R. Bell & Co on the evening of the 14th March 1846. Proposed that the Committee read their report. R. Bell Esq. proceeded to read the following report. 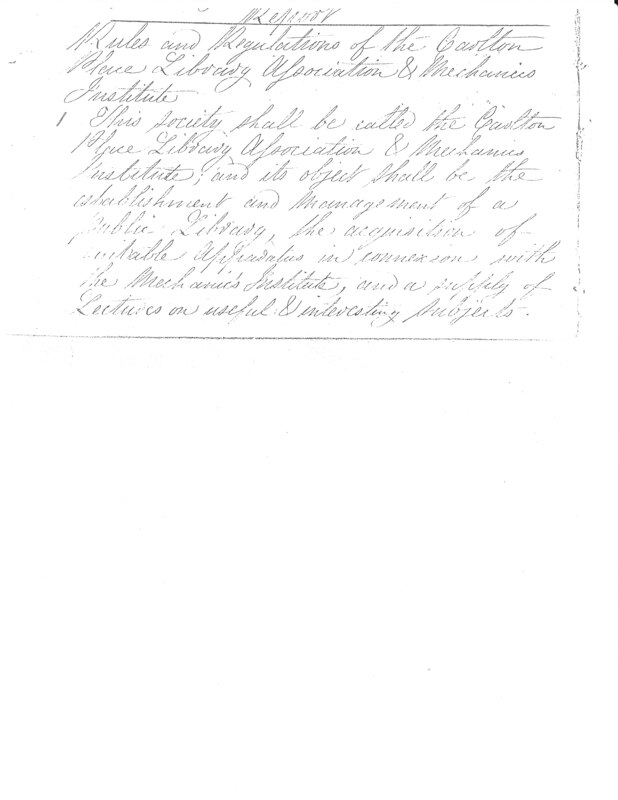 *Please note that Carleton was spelled without the ‘e’ in this document. What was Ida Moore, who some say is the ghost of Moore House in Carleton Place, reading in March of 1897? From a record book currently on display at the Carleton Place Public Library, which, I swear, just happened to fall open to this page, we see that Miss Ida Moore borrowed book number 503, which was the “Story of Antony Grace,” by George Manville Fenn. You too can read what Ida read in 1897, as the book is readily available online! Stay tuned for more in this series, “What were they reading?”, as we shed more interesting insights into Carleton Place ancestors by peeking at what library books were on their night stands. We may even still have some of them, and if we do, I will post a picture! Tags: Carleton Place Local History, Ida Moore, What Were They Reading?